These days, the news is filled with stories of shootings, lying and cheating, and people generally treating each other badly. This isn’t one of them. Last year when Hurricane Harvey hit Texas, an astounding 40 inches (100 cm) of rain fell in four days on the greater Houston area. 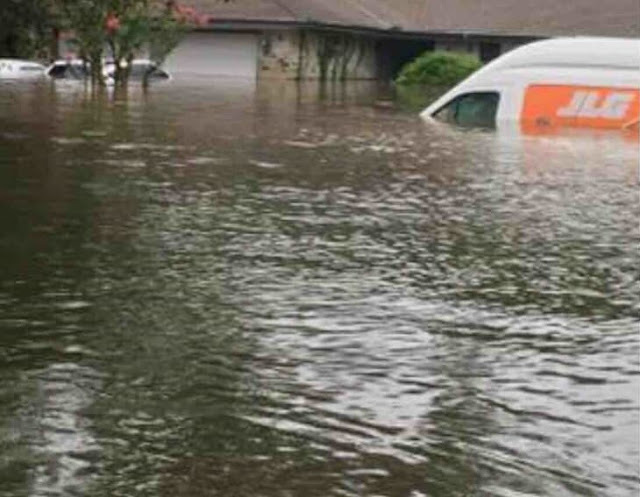 The record-breaking storm caused catastrophic flooding and forced thousands of people to flee their homes at a moment’s notice. Among those people were Carlos Sepeda Jr., his wife, Tammy, and their family. They moved all their belongings up onto tables, beds and anywhere else they could to get them off the ground. That didn’t turn out to be high enough for the destructive flood, though, and the water rose up almost as high as the roofs of their cars. But this Houston family’s hurricane story has a wonderful silver lining – thanks to a kindhearted waitress named Mary Gough. 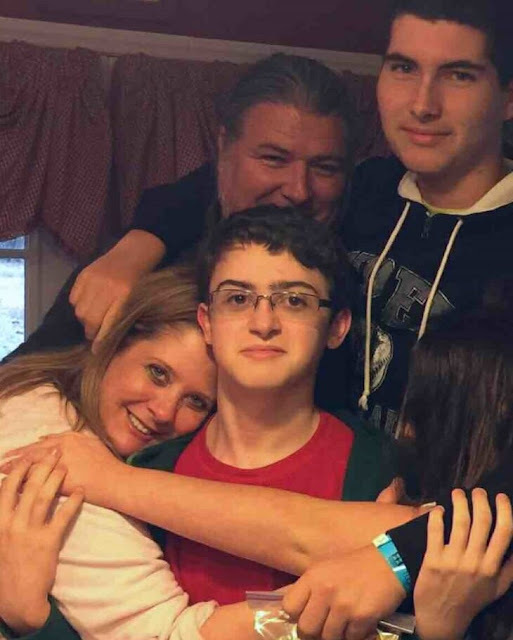 When flood waters from Hurricane Harvey engulfed the home of Carlos and Tammy’s house, they drove a couple hours north to Tammy’s mom’s house to escape the storm. There, Tammy’s mom took them for some comfort food at Sam’s Restaurant in Fairfield, east of Waco. After the Sepeda family sat down to eat, the subject of the hurricane naturally came up, and they found a sympathetic ear in Mary Gough, their waitress. Mary had seen the story of the devastating storm unfold on the news and immediately decided to help. When the Sepeda family finished their meal and were on their way out the door, Mary handed Tammy a folded note. Once she was out in the parking lot, Tammy took a look. What she saw stunned her, and she immediately showed Carlos and the rest of the family. 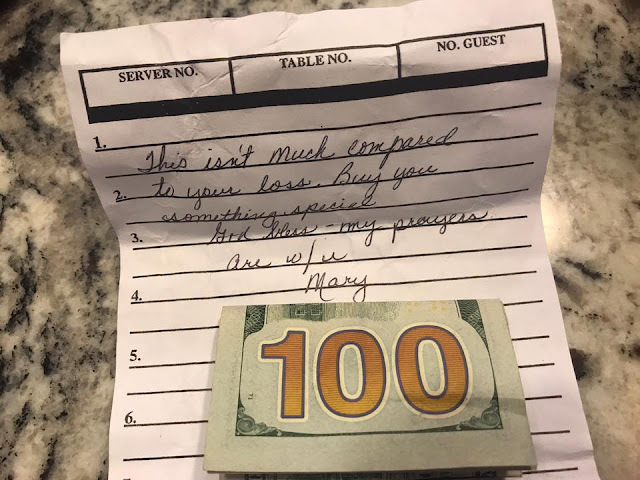 Mary also enclosed a $100 bill inside the note. Talk about going above and beyond to help some strangers in need! Carlos and Tammy walked back inside and tried to give Mary back the money, saying it was too much. But she refused to listen and said that she had prayed about it and wouldn’t take the money back. Mary even offered the couple a table and some chairs to help them refurnish their home. Carlos was so grateful that he took to Facebook to let the world know about Mary’s wonderful gesture. And as of this writing, his post has been shared more than 29,000 times and has also racked up more than 80,000 likes! 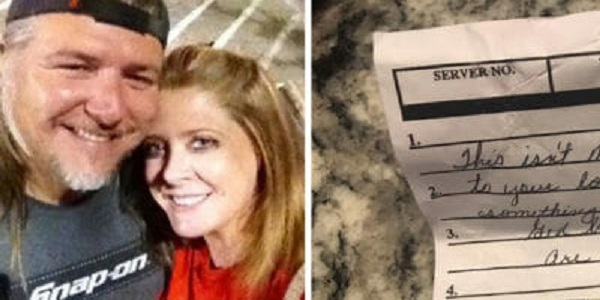 Were you also moved by the generosity this waitress showed to some absolute strangers? Share this story and help inspire others to make the world a better place!